Fully adjustable by operating the hand cranks at the foot of the bed. Hand crank handles fold down to be concealed and prevent injury. Side clips under angle iron store shaft when bed is unassmebled. Easy to set up. Back and foot adjustment allow for an anatomically correct sleep surface.Channel frame construcion provides superior strength and reduce weight. Channel frame construction provides superior strength and reduced weight. Zinc coated spring deck. Fully adjustable by operating the hand cranks at the foot of the bed. Hand crank handles fold down to be concealed and prevent injury. Side clips under angle iron store shaft when bed is unassembled. Easy to set up. 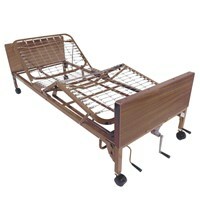 Back and foot adjustment allow for an anatomically correct sleep surface. Channel frame construction provides superior strength and reduced weight. Zinc coated spring deck. Heavy duty, vinyl clad bed ends are attractive in any decor and easy to maintain.CSA approved. maufactured in ISO9001 facility.